Renowned as Asia’s ultimate destination for a premier golf experience, Kuala Lumpur Golf & Country Club (KLGCC), is home to 100,000 golfing rounds a year and is host to numerous international championships. Jacobsen visited this sumptuous facility, which is situated in the unspoilt landscape of Bukit Kiara, just 8 km away from the heart of Malaysia’s capital city. Kuala Lumpur Golf & Country Club is a proprietary club wholly owned and operated by KLGCC Berhad. At its inception in 1991, KLGCC Berhad was incorporated as a private limited company and on 15th December 1992 changed its name to Kuala Lumpur Golf and Country Club Sdn. Bhd. and became a public company. In 1997 the Club was acquired by Sime Darby, Malaysia’s leading multinational conglomerate with interests in five core sectors: plantations, property, industrial, motors, and energy and utilities. Additionally, the company has a growing presence in the healthcare sector. The club opened in 1991 and features two stunning 18-hole golf courses, the East course and the West course, both designed by Hong Kong-based architects Nelson & Haworth. On arrival you are greeted by the elegant architecture of the clubhouse, designed by William Moisson in the graceful Spanish style of Southern California and situated within a stunningly picturesque landscape. At 6,071 metres from the back tees, the East Course is parkland style, with vibrant and highly colourful landscaping. The design takes full advantage of the gently undulating contours with indigenous grasses and extensive wetlands providing natural habitats for numerous species of wildlife and birds. It features impeccably maintained fairways and greens, challenging elevation changes and an environment that enhances the essence of the local terrain. The West Course is the longer and the more challenging of the two courses and at 6,372 metres from the tournament tees, it is the ideal venue for the major tournaments hosted by the club every year. The Malaysian Open was the first co-sanctioned event between the European and Asian Tours in 1999 and was held on the West course in 2006. After the completion of the 2006 Malaysian Open, the West Course was extensively reconstructed over a period of eighteen months by Kuala Lumpur-based E&G Parslow and Associates. The result was a tougher West Course, which reopened in October 2008 and now features a new lake on hole 9 and extensions to the previous watercourses resulting in water hazards on no fewer than thirteen holes. Both courses are in spectacular condition and this has contributed to a number of accolades for the club, the latest in 2013 include Expatriate Lifestyle magazine’s Best of Malaysia Awards 2013 – Best Golf Experience in Malaysia; Asian Golf Monthly Awards 2013 – Best Course in Malaysia (West Course); and Asian Golf Monthly Awards 2013 – Runner-Up for Best Championship Course (West Course). The club has played host to several major tournaments including The Maybank Malaysian Open, which returned in 2010 and is now firmly situated in the club’s calendar with the hosting of the event in 2011, 2012, 2013 and recently in 2014, when Lee Westwood was the victor. It has also been the home venue of the Sime Darby LPGA tournament since 2010 and again will be hosting the CIMB Classic. The CIMB Classic tournament is co-sanctioned by the Asian Tour and the PGA Tour and is the first event sanctioned by the PGA Tour in Southeast Asia. Now that it has official status on the PGA tour, the field has been increased to 78 and it qualifies for FedEx Cup points. American golfer Ryan Moore won the 2013 tournament, winning US$ 1,260,000 in the process. The man responsible for the management of the two courses is Nizam Othman, Course Superintendent, who has been at KLGCC for six years, the last four as superintendent. He is responsible for an incredible 180 staff, 90 of whom are involved in golf course maintenance and a further 90 looking after the grounds and landscaping. After obtaining a degree in Sports Turf Management from a New Zealand university, he began his career in 1994 at Tanjong Puteri Golf Resort in Johor, before moving on to Kota Permai Golf and Country Club in 1996, 20 kilometres southwest of Kuala Lumpur. After honing his turf management skills for the next 11 years, in 2007 he moved to KLGCC and in 2009 was appointed to the role of Course Superintendent. The club is a loyal customer to the Jacobsen brand and has an extensive array of mowers and other turf maintenance equipment. The maintenance facility has to be one the most impressive in all of Asia, but more of that later. The greens are hand cut with eight Jacobsen Eclipse 122 walking greens mowers, all with floating heads, to closely follow the contours of the undulating surfaces. Four Greens King IV riding triplex mowers are used around the aprons and 16 PGM 522’s are available for the tees. Jacobsen’s superlight SLF 1880’s manicure the fairways and TR3’s keep the surrounds and semi-rough under control. 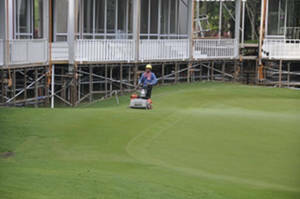 Completing the mowing equipment are two AR3 three-deck and two AR250 five-deck contour rotaries for the rough. During the remodelling of the courses, additional bunkers were added; there are now 96 on the West and 118 on the East and these are maintained with four Jacobsen Groom Master bunker rakes. Smaller areas requiring aeration are tackled using a pedestrian Jacobsen GA24, with a Toro ProCore 628 used for larger areas. The crew use 10 Cushman Turf-Trucksters for general duties around the courses and two dedicated Spraytek rigs. Four Smithco Spray Star’s complete the spraying line up and there’s also a Turfco WideSpin 1530 and two Vicon spreaders for applying top dressings. “There’s a tremendous amount of pressure on the playing surfaces here,” said Nizam, “not only from the increasing number of tournaments we are hosting, but also from the increasing number of rounds played by members and visitors. We are fortunate that with 36 holes we can take one of the courses out of play on occasions to undertake maintenance work. KLGCC has a range of nationalities across its staff and for the golf course and landscaping activities employs 65 locals, the remainder being Bangladeshi and other Asian ethnicities. Training is a hugely important factor and all staff will be able to multi-task, to some degree or another. This provides flexibility for the management team and a higher sense of involvement among the employees. “Every member of staff gets a minimum of 4 hours training a month,” said Nizam, “and that can take the form of on-the-job or classroom based here at KLGCC or we send them out for external courses with specialist training facilitators. We also review standard operating procedures every week to ensure that everyone is fully aware and up-to-date with what we are doing and what is expected of them. “Of one thing I am certain, we need more education for superintendents here in Southeast Asia; some are reluctant and do not expose themselves to further knowledge. Leadership and management skills are vital in the process of educating other members of the team. I know Jacobsen are getting more involved in training in this part of the world and that can only be a good thing. As hinted earlier, the maintenance facility at KLGCC is setting the benchmark for other golf clubs in the region. I have been visiting golf courses around the globe for the past 17 years and I can say with complete honesty that I have not seen one that has reached such high standards as here. Abas Ismail is the Senior Executive responsible for the workshop and proudly took me on a tour of his facilities. The machinery storage shed is immaculate; every machine is washed down after use and parked in a dedicated, numbered parking bay. There’s a special area attached to the facility for washing down and backlapping the walking mowers and any item that needs raising off the floor for maintenance is done using lifting equipment. There’s a dedicated grinding room and all chemicals are locked in a separate Hazchem safe. Outside is a dedicated washdown apron for the larger ride-on equipment and a refuelling station complete with underground fuel storage tanks, fuel pump, water and compressed air lines, similar to that you would find in a service station. All machines have a clearly visible service sticker which details the hour usage at last service and hours to the next engine oil change and hydraulic oil and filter change. Highly visible weekly maintenance charts for every machine are located on the walls of the facility and in a similar manner so are the Operator’s and Parts manuals. There are Health and Safety notices everywhere to encourage a safe working environment and a neat and tidy room containing spare parts with all items on racking, clearly visible and easily accessible. There’s even etiquette boards; strategically positioned, to act as constant reminder to all staff to be respectful of the golfers’ needs, while at the club. Inside the facility Nazim and Abas have their respective offices close to the nearby training and meeting room which has an array of audio visual equipment. An outside covered dining area for staff completes this impressive facility. Commenting at the end of my visit, Abas Ismail said, “At KLGCC the management understands that a properly designed and run maintenance facility will reduce our overall running costs and result in a better maintained golf course. Without a doubt, Kuala Lumpur Golf and Country Club has earned its reputation as a premier golf resort in Asia. It is a spectacular golf facility, with a dedicated team determined to keep on improving the facility. Long may it continue!